Florence is located 20 miles south of Missoula off US 93. Play in the Bitterroot Mountains, fish or float the river, or follow one of the town-based trails. Stay at the local bed and breakfast or at a nearby campground. Enjoy homemade fare at the café. Attend the Renaissance or Harvest Festivals. Florence, MT is located at the northern end of the Bitterroot Valley, only a half hour south of Missoula. This small town was originally an important logging community, established by Irish and German immigrants, that featured a post office, railroad depot, saw mill, hotel, churches, blacksmith shop, saloon, and livery by the turn of the 20th century. Today, Florence is a great place to access the Bitterroot Mountains and River, with trails, campgrounds, and wildlife areas located in the vicinity. Florence is located off US-93, 20 miles south of Missoula. 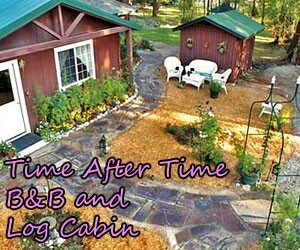 Meander down the mile-long nature trail amidst 20 acres of gardens, forest, and creek on the grounds of the local bed and breakfast before enjoying a full meal and warm bed. Alternatively, choose from a variety of campgrounds near the Bitterroot River or in the National Forest. Tuck into a homemade pie or sandwich at the local café and fill up your vehicle at one of two service stations. 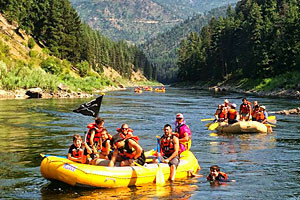 Enjoy year-round recreation on the Bitterroot River and in the Bitterroot Mountains and National Forest. If you prefer organized sports, play a game of baseball, soccer, tennis or softball at Florence Park and Hideout Mountain. From town, walk or pedal north towards Lolo and Chief Looking Glass campground or travel south to Stevensville and Poker Joe River access on the local trails. Annual festivals include Florence’s summertime Renaissance Fair and the autumn Harvest Festival. During winter, enjoy snowmobiling, skiing, and snowshoeing activities. During summer, travel 9 miles east of Florence and see elk in their native summer range at Threemile Wildlife Management Area. From Missoula, drive 10 miles on US-12 W and continue onto US-93 S for another 10 miles. In Lolo, stop at Travelers Rest State Park or visit the Holt Heritage Museum. As you continue your journey, keep your camera handy for snapshots of the gorgeous peaks and river views.